(Newser) – Some extremely hot chili peppers can cause a lot of discomfort. The Carolina Reaper can put you in a medical journal. A study published in the BMJ looks at the case of a 34-year-old man who developed "thunderclap headaches" after consuming just one of the incredibly hot peppers at a chili-eating contest, reports the Guardian. 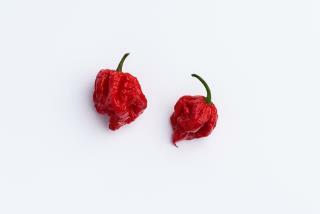 Researchers say the man suffered dry heaves immediately after consuming the Reaper—which scores an intimidating 1.6 million on the Scoville scale versus 5,000 for a jalapeno—and went to the emergency room a few days later because he was having very short but incredibly painful headaches. "It started all of a sudden as severe pain in the back of the neck and then spread to all over the head," study author Dr. Kulothungan Gunasekaran tells CBS. "That's typical of a thunderclap headache." OOOOOHHHHHHHH...... that first bowel movement must have burned out his poor sphincter. "Extremely Hot Chili Triggers Brain Condition" Fixed it: "Brain condition known to lay people as 'stupidity' causes person to eat extremely hot chili."